The open feeling afforded by the oversized lounge and large windows makes this car an easy place to relax. Two large Pullman-style bedrooms equipped with sink and reading chair adjoined by a spacious bath and dressing room. The formal dining room separates the kitchen from the sleeping and lounge areas. A vestibule at each end of the car gives everyone a place to stand outside and watch the scenery pass by. Based in the Tucson/Phoenix area. 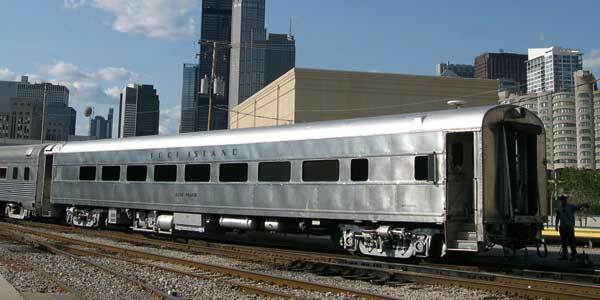 Built by the Pullman Company in 1947 as a 68-seat coach for the Rock Island. This car saw service on some of the finest streamlined trains of the era. The car was rebuilt by the railroad in the early 1960s and was in active service till 1979, just before the railroad’s 1980 shut down. Sold to a number of private owners, the car was rebuilt as an executive sleeper-lounge in 1991. This car has covered the country from corner to corner and everywhere in between.